A new Quinnipiac poll (pdf) continues to show Republican front runner Donald Trump having difficulties in a general election. Bernie Sanders beats Trump by thirteen points and Hillary Clinton beats him by seven points. The race is close if Rubio or Cruz is the nominee. It is not surprising that Sanders does significantly better than Clinton in this general election match -up considering how weak Clinton generally polls among independents and in the battle ground states. There is the danger that both parties will nominate their weakest (and, as I discussed yesterday, most dishonest) candidate based upon their current positions in the polls. It is noteworthy that in this Quinnipiac poll, Sanders runs so much stronger than Clinton against Trump. It is also noteworthy and important that both Sanders and Clinton run so far ahead of Trump in general election match-up polling. And it is profoundly important and revealing that Sanders would defeat Trump by such a huge margin — 13 points in this poll — that analysts would be talking about a national political realignment and new progressive era in American history if an enlightened candidate such as Sanders would defeat a retrograde race-baiting candidate such as Trump by a potentially epic and historic margin. It is time for the mainstream media to end their obsession with Trump and their virtual news blackout of the Sanders campaign when discussing presidential campaign polling. 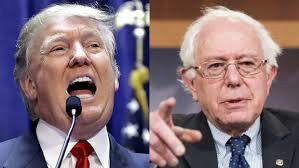 How about, from now on, when any analyst on television discusses how strong Trump allegedly is, that it be emphasized that this strength is only within the GOP, and that in a general election, the real heavyweight champion of presidential polling is Bernie Sanders, not Donald Trump! Budowsky has an excellent point that if Sanders lead were to hold, “Democrats would almost certainly regain control of the United States Senate and very possibly the House of Representatives.” I also think that Democrats would do much better in Congressional elections if Sanders were heading the ticket because, with the high degree of distrust for Clinton, a significant number of those voting for Clinton for president would consider voting for Republican Congressional candidates to put a check on her. As Budowsky said, nominating Sanders provides the hope for political realignment and a new progressive era. Nominating a far more conservative candidate such as Clinton would lead to a return to the policies of George W. Bush on far too many issues, along with preserving a Republican Congress and continued gridlock. I hope voters in Iowa and New Hampshire, and then subsequent primaries, consider how different things will be by nominating Sanders as opposed to Clinton. Democrats who use fear of Republicans as their main argument in favor of Clinton, should also consider that nominating Bernie Sanders is our best shot at getting away from Republican policies. Posted in Bernie Sanders, Donald Trump, Hillary Clinton, Politics, Polls. RSS feed for comments on this post.. TrackBack URL. Sanders' hero is not TR, not WW, and not Taft. It's Gene Debs. That means something. Though his agenda is progressive, his heart is socialist, and I mean that the way Debs did, public ownership of the means of production. All the same, he's better as a progressive than Hill, of course. And not as likely to spend trillions on new wars or to push through disastrous regime changes. No, Sanders does not believes or advocate public ownership of the means of production. He made his actual economic views clear in his speech on the subject. Not spending trillions on wars or regime change is a strong point in his favor. You need to distinguish his agenda from his ultimate, if wistful, commitments. You need to look at his real beliefs and agenda, not right wing paranoia.